When I was a kid in the 50s, I learned that health insurance was non-profit, which my parents explained, was the way everybody chipped in money to help pay for the unlucky few who might need expensive medical care at any time. It made sense to me: it was another way that grown-ups worked together to take care of each other. It also helped me feel secure and free of worry. We all took care of each other, like we should. So...what happened? Blue Cross and Blue Shield were “community-rated” non-profit insurance plans in the 50s. Such insurance companies estimated cost of claims for the next year, and set the premium price to cover costs by simply dividing it evenly among all premium purchasers. Healthy people paid more for the needs of those less healthy when they needed it, and had security and reassurance that they’d be covered if they needed it, too. There were no “high risk groups.” We were all equally into it together for the long run. During the late 50s, for-profit health insurance companies started selling cheaper insurance premiums to only younger, healthy people, whose claims would also be low (at least for a number of years until they got older). By appealing to healthy peoples’ interest for short-term cost-savings, for-profit insurance pocketed some profit for itself. When healthier people abandoned the community-rated non-profit plans to buy this for-profit insurance, Blue Cross/Blue Shield was left with fewer healthy people in their pool to help pay claims for older, sicker patients, so they had to raise premiums. Eventually, all insurance plans were forced to charge different rates based on age and health history, just to keep enough healthy people in their plans as well. 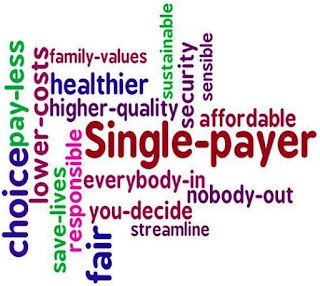 What we now have is a system created by the marketplace and defined by for-profit insurance; where patient risk groups and premium charges are decided by insurance to be sure that profits are made at each step by dividing up a selected under-65 population of mostly employed folks. The much more costly older, unemployed and chronically ill population is covered by Medicare and Medicaid tax dollars, (which we all pay into and eventually benefit from in different ways). Private insurance’s main mission is to create profit with each premium sold (AND CLAIM DENIED) to benefit stockholders and the board of directors; not to serve the larger community’s health needs. This is the exact opposite of what made “community-rated” non-profit insurance work for a diverse population. We’ve gone from taking care of each other in need... to every man for himself, if he can afford it. Today’s health insurance adds nothing to quality of care, care provider efficiency, availability or improved communication or advocacy for patients. 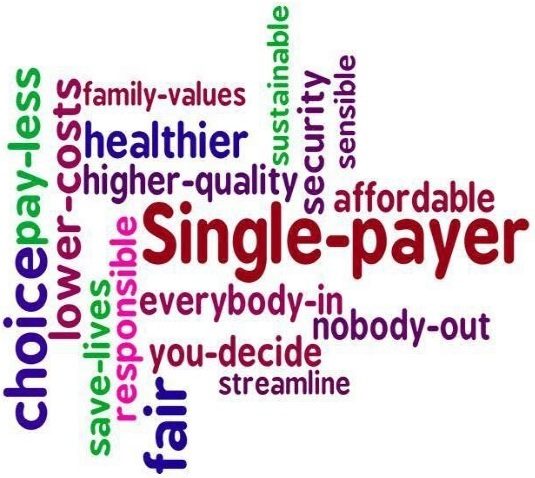 It has wormed its way into our health system as a parasitic middle-man, which manipulates and profits from the fact that we will all age and eventually need more health care...for which we will then pay a higher premium. Administrative costs are twice as high in as in other non-profit national health systems. The dysfunction and drain on our resources has become unsustainable. A national movement to establish Medicare for All is underway, which could lead to restoration of a non-profit community-rated alternative to the for-profit system. Here in Wisconsin, we have the option of creating a Badgercare for All (as proposed by Mike McCabe) as a state model , which would offer a lower cost non-profit health insurance to all Badgers. Such health insurance would be a state-sponsored service for many, not a corporate profit industry for a few. Hospitals, doctors and care institutions would remain private and independent, giving patients freedom to choose. Universal, state-wide Badgercare expansion would expose the inflated costs, manipulations and inefficiencies that for-profit insurance has inflicted on the public. For-profit insurance would need to compete to provide better service at lower cost. The public knows that affordable health insurance is needed community-wide, and needs a seat at the table through our state government. Walker’s recent change to support Obamacare in Wisconsin is evidence that he’s now feeling public pressure to protect health options; not only for-profit insurance. However, Walker’s shell game to finance Obamacare for the middle class by cutting Badgercare funds and generate “Medicaid savings” to cut Badgercare funds to create “Medicaid savings” is clearly designed for short-term political gain. Weakening Badgercare at the expense of our most vulnerable and needy is no solution to the problem of how we best care for each other at times of crisis and need. Contact your state representative and senator to oppose Walker’s proposed raid on Badgercare funding, and then mention Badgercare for all Badgers as a better Wisconsin idea.